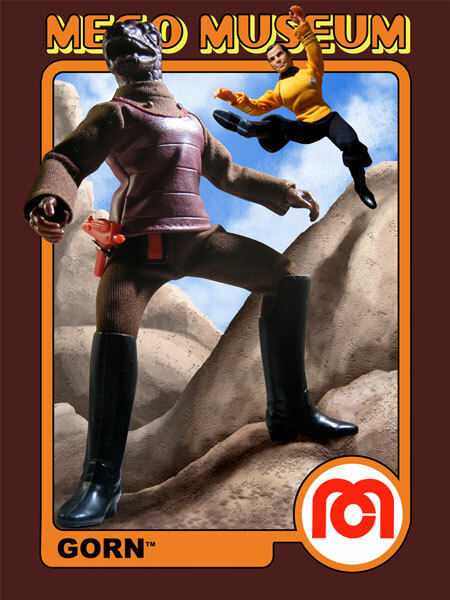 Above we have a Gorn on a “10-back” card. This specimen is wearing the first tunic (creamy-maroon/red). 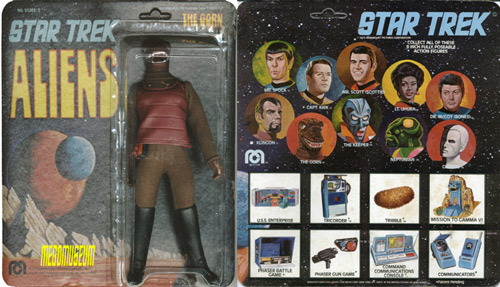 Above we have a Gorn on a “14-back” card (considerably rarer than the “10-back”). This specimen is wearing the first tunic (creamy-maroon/red). 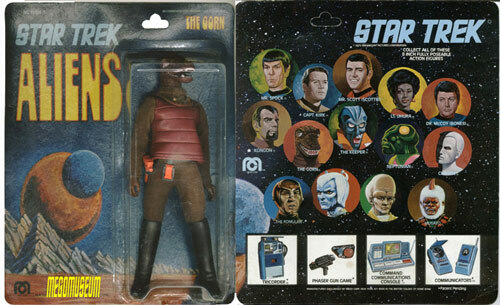 Gorn uses the same weapons belt as the regular Trek crew. The Trek weapons belt has been reproduced by Doc Mego and it is very difficult to spot. The reproduction has a very slightly more rounded look around the holsters, but even that is hard to see. The reproduction is unmarked. 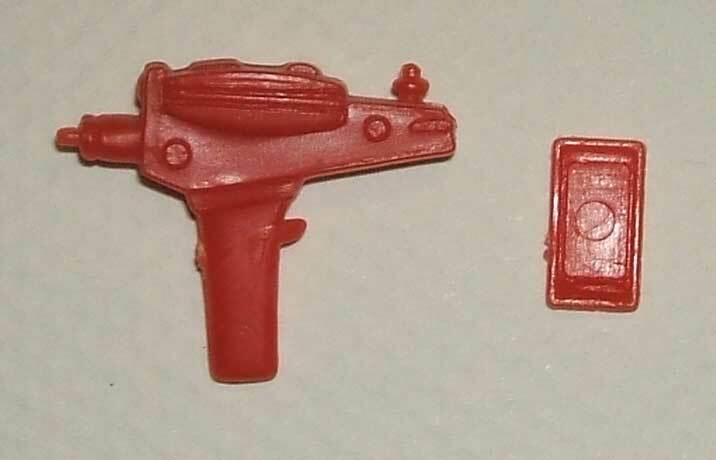 The villian weapon set consists of the same phaser and a communicator the crew carries, but in red instead of blue. They are cast in the same color red, but there are various degrees of fading known. There are no factory made reproductions available. Gorn has the same boots (as well as suit) as another Trek villian, Klingon. The boots are also to be found on the Black Beard figure from the Pirates line. 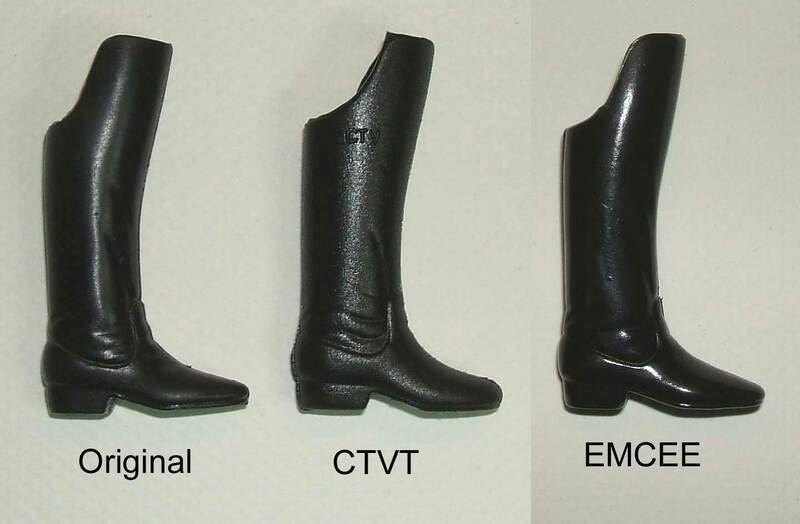 The boots have been reproduced by Classic TV Toys. The reproductions are a tighter fit, and less glossy. They have a slight texture to them, where the originals are very smooth. They are marked CTV on the side.